The "Lifting Up the World with a Oneness-Heart" program is a unique award that was offered by Sri Chinmoy to recognise individuals from all walks of life who had inspired and uplifted humanity. 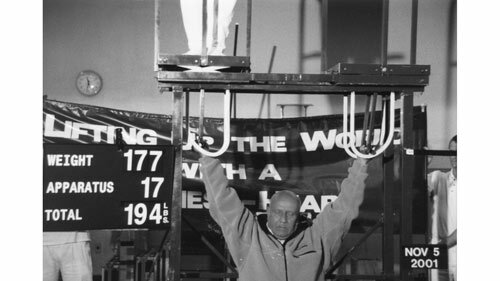 Sri Chinmoy lifted the recipients overhead either with one arm or both arms using a specially constructed platform in a symbolic gesture of oneness with their uplifting achievements. Beginning June 1988, Sri Chinmoy honoured more than 8,300 individuals in this manner, including Heads of State, diplomats, spiritual and religious leaders of many faiths, distinguished achievers in the arts and in literature, Nobel laureates and world class athletes. Sri Chinmoy also recognised individuals, less well known, but providing important public service, such as firemen, doctors, pilots and academics. Lifting up the World with a Oneness-heart at Inspiration-Lifts. Includes video with Desmond Tutu and actress Helen Hunt talking about being lifted. Are Miracles Real? - Rabbi Marc Gellman talks about the experience of being lifted. Originally published Newsweek, 29th Oct, 2007.